I have been itching to experience glass blowing. But in the SF Bay Area, there are not many places that offer classes. Most glass workshops are located in less than desirable locations. And beginner courses don’t come cheap, easily costing more than $100 per person. Despite the hurdles, I was dedicated to finding a fairly priced glass workshop that offered at a glass blowing course. The first recommendation from fiends was Public Glass in San Francisco, specifically the “Hot Glass, Cold Beer” event where the name says it all. Despite being local, it was located in Hunters Point, a part of San Francisco I actively avoid. After some brief Googling, I found another glass course offered at a local winery, La Nebbia Winery, off 92 on the way to Half Moon Bay called Half Moon Bay Art Glass. The only problem with Half Moon Bay Art Glass is the substantially higher price, nearly $160 per person for a 90-120 minute group course. After more searching, I came across a Groupon for Slow Glass Burn that was $200 for 2 people for a 3 hour group course. I jumped on the deal ASAP and booked an appointment. Slow Glass Burn is located in West Oakland. I am not as familiar with Oakland as I am with San Francisco, but the vicinity felt undeveloped and unmaintained. The paved road leading to Slow Glass Burn were uneven and ridden with potholes. There were not many other cars around and a few homeless people wandered the streets. Parking was not a problem near Slow Burn Glass, but I still wanted to park as close as possible to the main entrance and keep items inside the car out of view. But once inside the Slow Glass Burn warehouse, the uninviting environment outside was out of sight and out of mind. The beginner course was exactly that. It was very simple. The class is designed for 4-6 people, but we got lucky and were the only couples (the other two had a last minute emergency and could not make it) and got a private lesson. Before we began, there was a simple walkthrough of their facility, the general process, and important terminology. Afterwards, we began with the glasswork. In total, we each made 3 items. A snowman, a paperweight with added colors, and a large clear cup. Each item was more difficult than the first, and you build off of previous techniques. We watch the instructor (Josh) demo the steps to make the glass. We then alternated, each with one on one attention as he walked us through the process. And although we had our hands on the tools, it felt very that the instructor was doing all of the difficult work. And to be honest, there is a lot going on simultaneously and looks much easier than it actually is. Without the instructor’s guidance, there is no way I could honestly repeat the process. My opinion of the course was despite heavy hand holding throughout the glass work process (which was very necessary for the beginner course), I had a lot fun. There is too many skills to master in just a few hours. But after completing the beginner’s course, I can better gauge my interest to attending a more advanced class, which I assume involves more independent work. Given the price and the end results (both knowledge and artwork), I highly recommend Slow Glass Burn. Now for some course suggestions. 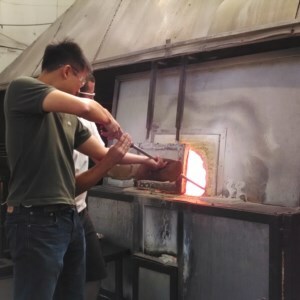 Even though the following suggestion would not affect myself (since we lucked out with a private lesson), if I had to give Slow Burn Glass suggestions for the beginner course, it would be to provide an area for class members to practice techniques (like rolling the bar) while waiting for one on one instructor attention. But overall, I now have a much better understanding of how difficult it is to work with glass and better appretiate glass artists like Chihuly.